Described as a report in which you could hear “scientists screaming” between the lines, the IPCC Special Report on 1.5 degree warming was released in October 2018. It helped focus wider media and public attention on our rapidly changing global climate. 1.5 degrees of warming means increasing numbers of coastal zones will be underwater. And to keep global warming to “only” 1.5 degrees requires we rapidly transition away from carbon-intensive fuel sources, and the infrastructures, both physical and social, that provide them. Even at 1.5 degrees, water is coming. In some places and on more and more frequent occasions, it is already here. Nearly 40% of the planet’s population (2.4 billion people) lives within 100 kilometers of the ocean; 10% (600 million people) lives in coastal areas fewer than 10 meters above sea level. With 1.5 degrees of warming, some Pacific island nations, including Small Island Developing States, will disappear entirely. Closer to Penn’s own campus, 1.5 degrees will raise sea level enough to inundate approximately one third of the state of Delaware, all of the Philadelphia International Airport, and most of the low-lying historic wetlands up and down the Delaware Bay that are today home to industry, including the east coast’s largest oil port, human communities, farms, recreational areas, and wildlife refuges. Nuisance flooding is already becoming the norm. The IPCC’s special report urges that “education, information, and community approaches, including those that are informed by Indigenous knowledge and local knowledge, can accelerate the wide scale behavior changes consistent with adapting to and limiting global warming to 1.5C” (ES, D5.6). In that spirit, this three-day convening features water research groups working at the intersections of art and science in both formal (university and college) and informal (museums, libraries, and non-profit) educational settings with local communities on five continents. Our gathering provides the occasion to bring these diverse projects on water and sea level rise into conversation with one another. Together, we will consider how, as sea-level rise re-makes coastlines today, it is also re-shaping the landscape of higher education and calling for civic collaborations at local, national, and global scales that cross and connect both formal and informal educational institutions. Gathering researchers, teachers, artists, and students of all ages hailing from diverse and differently vulnerable communities, we will explore how we can develop and use transdisciplinary methods of inquiry to learn, teach, and live with rising waters and how we might work collaboratively to develop new educational tools. Since 2016, PPEH has piloted on-water teaching and learning engagements under the banner of the Schuylkill River Research Corps, including the On-Water Research Intensivein June 2018, as well as the ongoing three-year program, Rising Waters: Philadelphia and Mumbai, funded by a Making a Difference in Diverse Communities award. This convening brings these and other initiatives based in the Delaware watershed into dialogue with scientists, humanists, and artists working on, around, in, and with the Hudson, Passaic, Susquehanna, and Mississippi Rivers, in North America, as well as with others working on waters on five continents. Research presentations alternate with artists talks, screenings, literary readings, and public performances. We anticipate that this gathering will nurture public research and creative engagements spanning the sciences and the arts, natures and cultures, across water bodies and watersheds. We hope you will join in. 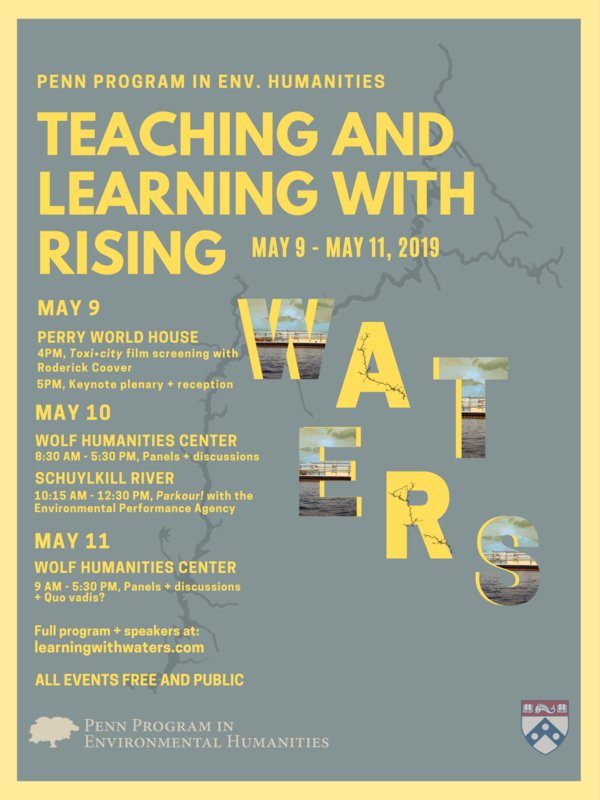 Check out the Teaching and Learning with Rising Waters website here.